Cottage cheese is used a lot in Russian cooking so it has always been part of my daily life. I love pancakes rolled up with sweetened cottage cheese inside and served with some red berry souse. Should I even talk about varenyky (Ukranian dumpling) stuffed with cottage cheese with sour cream and butter melting on top of them? Varenyky as well as some other Ukrainian dishes are also part of our family cooking as my grand grandma was a Ukrainian. She was the one why taught my mom and then me to cook. 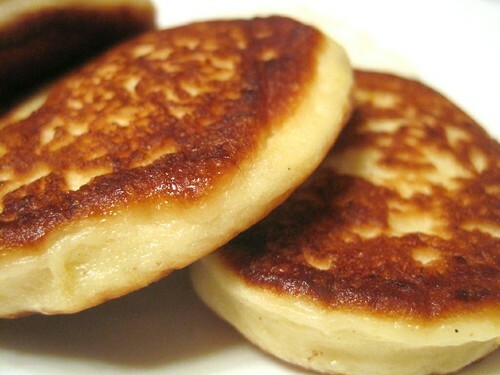 Another thing is syrniki - cottage cheese pancakes cooked across all Eastern Europe. It's one of those dishes that I grew up with. I moved from watching how my mom makes them to helping her make them and finally to making them myself. Syrniki are a way of life food. They just have to be there from time to time. They are simple to make and they are delicious so I'm sharing my recipe with you. I'm not pretending it's a classical one, it's just my family one. We prefer them with less flour (it makes them really tender). I also love adding lemon zest and vanilla. Both obviously do not come from traditional recipe. However with cottage cheese they make a perfect combination and the aroma gets just incredible. Combine the eggs with sugar, salt, lemon zest and vanilla sugar. Add the cottage cheese and mix well. Add the flour and mix. Start from 2 tbs. If you see the butter is too thin, add the third tbs. The final texture should be around this. In a large frying pan heat 2 tbs of vegetable oil. Set the heat to medium and scoop the butter in using a table spoon or ice-cream scooper. Cook for a minute or 2 till the syrniki get good color from one side. Flip them over, reduce the heat to low, put the lid on and cook for another 6-8 minutes. Take ready syrniki out and keep them warm till serving. Repeat with the rest of the butter. Syrniki are best right out from the pan so be sure to have at least one while you're making them. I prefer them served with sour cream, but pick something you like: butter, honey, sweet condensed milk and jam seem to be the favorite compliments in Russia. that's great! I think ricotta is a good choice. It's really very close to cottage cheese in its texture, I'm sure syrniki will taste great with it. Please let me know how it goes! i'll now try them with ricotta myself! Mmm...sounds very good. The dumpling you mentioned sounds good to. I have somethings to try next time we have pancakes or even dumplings. Thanks for sharing. I tried them with many kinds of cheese. I'd say, you need to drain the cheese if it is too moist. The one I used here (on the photo above) is OK, you don't need to drain it. If the cheese has liquid separating from the curd then it is better to drain and consider adding 1 more tbs of flour to the recipe. Most of all I like them with the cheese like the one in this recipe. I guess that's just my habbit:-). The moister the cheese you use the more dense they become. I like them airy as they come out if the cheese is quite dry. You might also want to try ricotta. One of the readers used it in the recipe and said it came out really good.